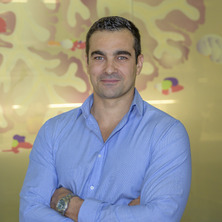 Dr Giacomotto is a young investigator strongly attracted by translational research, genes and diseases, imaging/automatic systems, drug discovery, chemical biology, and medical applications. His work focuses on translating little discoveries made in a single cell or in a model organism to an applications or treatments for human. He has already made discoveries that benefits human health, such as treatment for muscular dystrophies. He is working with a wide diversity of models, including cell lines and mouse models, but he recently spent a lot of time working with the zebrafish model. He beleives that this small fish will have an important impact in the seek of treatments for neuromuscular and neurological diseases. Those diseases are very difficult to reproduce in a single cell, making the search of chemical treatments difficult. This fish opens a new avenue for the screen of bioactive compounds and for understanding the progression of these terrible disorders. He believes in translational research, the zebrafish is for him a fantastic complementary model to cell lines in order to recapitulate human diseases and run large-scale experiments. He is working on developping future therapeutical strategies to alleviate the suffering of human patients. Journal Article: High-throughput screening and small animal models, where are we?